Caminos de Agua recently intensified its research on how to remove arsenic from heavily polluted groundwater. Martijn Eikelboom, our Dutch volunteer working on his thesis research, began a new round of experiments in march and is finalizing his research this week. His research’s main aim is to develop the low-cost material capable of removing arsenic directly from our local drinking water. Arsenic concentrations of up to 80 µg/L have been measured in drinking water in rural areas around San Miguel de Allende – 8 times above the WHO guideline limit of 10 µg/L. Contaminants like arsenic can be removed using appropriate techniques like reverse osmosis or other technologies. However, these technologies are expensive and are therefore less accessible to communities in the rural area of Guanajuato. Martijn began his research by working on preparing and testing different types of wood-char suitable to remove arsenic. His research involves preparing wood-chars appropriate for arsenic adsorption and testing them in Caminos de Agua's lab. "Growing up in The Netherlands I’m used to turning on the tap to get potable drinking water without even thinking about how the water was pumped from the ground, treated, and transported to my home. It’s just there. Working and living in Mexico really put things in perspective for me. Visiting the beautiful communities in the rural area of Guanajuato and seeing how blackened some of the kids teeth are, seeing those teeth when they smile, gave me the emotional drive to work on this project and ones like this. Sometimes the truth hurts, especially when the truth is that your family’s only available drinking water source is contaminated groundwater. Mexico taught me a lot, inspired me for a lifetime, and been an incredible and special time. I wish the people I met in the communities all the best, and feel grateful to have worked alongside the Caminos de Agua team and to have had the chance to contribute a little to their amazing life-changing work. As I’m on the point of leaving, I feel sad but happy at the same time as I’m looking forward to see what the future holds and what change this research and the work of Caminos de Agua will bring to the people. Agua para la vida." The first phase of Martijn’s study worked with the material suitable we plan to use as the base of the filter medium: wood-char. To make the wood-char, scrap wood was burned in a biomass gasifier without oxygen. Because of the limited amount of oxygen inside of the biomass gasifier, the wood is charred and transformed into a porous filter medium. Initial laboratory experiments demonstrated that the wood-char itself does not effectively remove arsenic in the desired maximum concentration. To improve the arsenic removal efficiency, the wood-char needed to be impregnated with substances which have a high affinity to bind with arsenic. Martijn proceeded to dive into existing research literature and selected three promising iron compounds to test: FeCl3, Fe2O3, Fe(OH)3. All three are highly recommended to use for arsenic removal. Martijn tested the three different common iron compounds impregnated to wood-char in different ways to gain insight in how the wood-char could be best modified. After 400 tests, long days, and a lot of ups and downs, Martijn succeeded to create a filter medium capable of reaching an adsorption capacity of 60 µg arsenic per gram of wood-char. As Martijn’s time here is limited to three months, the study will continue with a new researcher at Caminos de Agua. 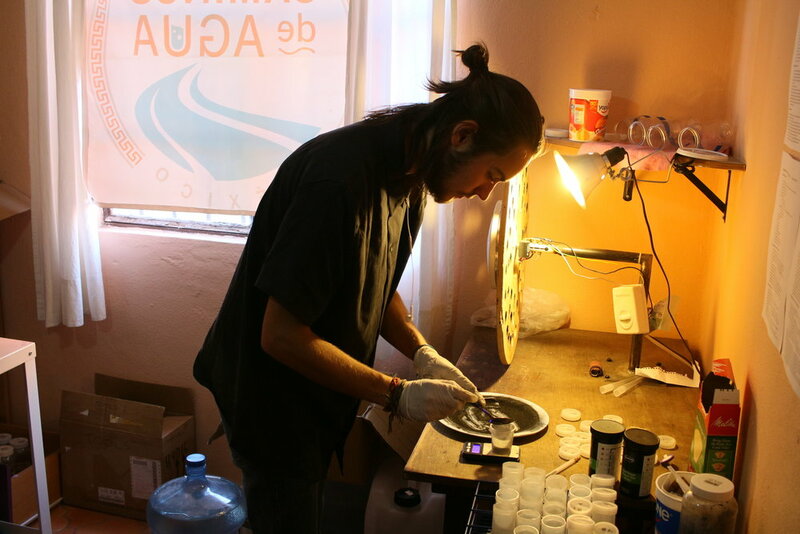 Although the “gold standard” has not been reached, Caminos de Agua now has a lot of insight in how wood-char can and should be modified and will continue research to create the filter that will combat the excessive arsenic concentration in drinking water.